Before you can do anything on Chatdesk, you need to create an account and login. when a guest is having a reservation at your hotel, you add his reservation details to Chatdesk. This includes his room details, phone number, email etc. If his phone number is added, a special link is sent to him via SMS, using which he can start chatting/interacting with the hotel. If your have setup hotel with its menus uploaded, the guest can also place an order for room serice via his phone. This enables him to place order from anywhere, anytime and not being limited to the room. You need to add a hotel to your account in order to accept guests to it. You should add hotel details, the welcome message that he gets on the phone etc. Admin : is able to add reservations to a hotel, chat with guest, see order requests and mark them as fulfilled. He is also able to change hotel details such as menus, welcome message etc. 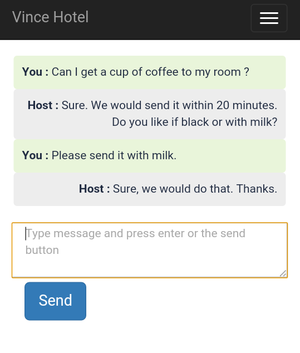 Chat assistant: Chat assistant is able to add reservations to a hotel, chat with guest, see order requests and mark them as fulfilled. He can not change hotel details. Depending upon the needs of your hotel, you can add the appropriate people. If your hotel has facilities such as a restaurant, a cafe etc, you might want to allow your guest to browse these facilities from anywhere and also place an order for them. Thats it! You have added hotel, people to it, menus etc. Now you go to the "Chat with guests" section and you add a reservation to this hotel. Whenever a the guest pings you with a message, you would be able to see the message with notification. Similarly, whenever a guest places an order, you would be able to see the order and serve the guest. Guest engagement via mobile phone Available on one click. So that's all you need. All the services of your hotel are now available to your guests via phone. You have provided him with a voice, showcased what your hotel has to offer and provided him with mobility in using those facilities. All are today the basic needs of a modern hotel guest. Wish you great success in providing guests with great customer experience.